Wexford Harbour and its Slobs are a natural haven for birds as they are the closest point for birds migrating into or out of Ireland from Britain and the Continent from a southerly direction. 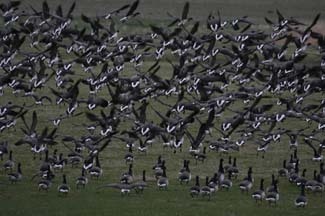 The Wexford Slobs are internationally famous for wild geese which spend the winter months here. Waders and wildfowl in particular are attracted to the area where the flat landscape and the wide shallow harbour with its sandbars and mud banks provide safe areas to feed, loaf, roost and breed. The Visitor Centre has many interesting exhibitions and an audio-visual show.